Foxs Lane: Let's get swapping! CLOSED!! Thanks so much for all your wonderful supportive comments yesterday. Blogland is so wonderful at making me feel normal in my chaos, or at least helping me see the humor in it. Thanks also for your swaperama interest. A little part of me was nervous that I would set it all up and no one would want to play with me. So let's talk about the swap. Each participant will sew, patchwork, crochet or knit one pincushion for their swap partner. The pin cushion can be any dimension and size you want, but please try to make it as gorgeous as you possibly can. There are zillions of pin cushion patterns and tutorials on the internet, ask Mr Google and see for yourself. Some of my favourites are Leonie's, Leah's, Spud and Chloe's and Lion Brand's. Check out your swap partner's blog. 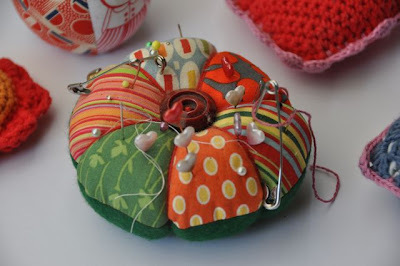 See what sort of colors and style they use and then make a pin cushion that you think they would love. Please don't let them know that you are making their pin cushion though. Let it be a wonderful surprise when your package arrives. If you would like to add a little something like chocolate or a packet of pins that is entirely up to you. Sooooooooo, if this little pin cushion swap appeals to you, please leave me a comment on this post. any specifics you might have e.g. a favourite colour, a preference for where you post to..
Just to make it clear, I need you to comment AND email me. That way I will have all of your details and am less likely to leave you out. I will leave the entries open until Monday when I will email you your partner's details. Your pin cushion must be in the post no later than the 16th of April (one month from Tuesday). If anyone has any idea how to make one of those sidebar buttons that people can display PLEASE contact me. 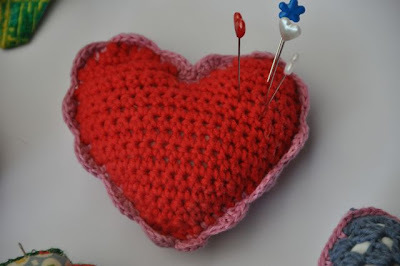 I am aiming to have links to all the participating blogs on my sidebar when we get going so we can all check out the wonderful pin cushions as they start to arrive. I think I have covered everything, please let me know if I have missed out on anything. Entries for this swap are CLOSED!! I am in for sure!! I'd love to join in too Kate!! Oh Kate - I'd love to join you but I'm never going to be able to meet that deadline if I'm out of the country! Great idea though - should be fun! And as for making a jpeg.. I use Paint.net for all my pictures (it's free to download) and it's pretty easy to use. Me too. My first swap..can't wait. Oh I think I could possibly manage this quick swap. The examples you've shown have me swimming in ideas already! This is going to be fun. Sounds like fun! A quick and easy swap is a good swap for sure. Oh, count me in Kate! Very do-able I think! How exciting! I would love to be in! I so desperately need a new pin cushion and I'm too lazy (I mean, busy) to make one for myself. This will be all the motivation I need. Kate, I would love to join your delightful swap. 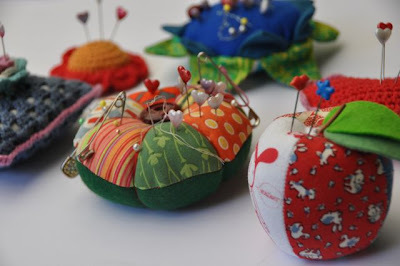 It would be fun to make and receive a new pincushion. I'm in! Ok? :) Off to email you now! I can't knit, sew, crochet or even finger knit, but I think the idea of sharing your beautiful creations in this way is simply divine. Just the idea of all of those happy sewers out there receiving their packages has made my day! And I'm not even a hippie!! i thought about it for a couple of hours just to make sure and count me in. oh n! yes please I would love to join! I'm so in! 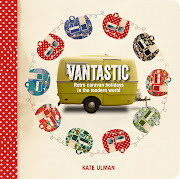 thanks so much for hosting Kate! Count me in too Kate! How much fun will this swap be. Off to email you now with the details! Can I please play too? In like veritable Flynn, I am! I'd love to join in!! I say you can never have enough pin cushions! I love pin cuchions :) I am in (please). Oh please count me in! This is my type of swap!! So cool! Thanks for having us play with you! I'd like to join in too. Sounds like fun - count me in. May I play too please? I haven't swapped for years! I would love to join this swap please! well, i may aswell give it a go! 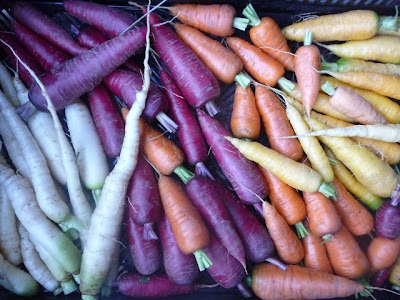 Excellent swap idea - sending you an email now! This is just what I need to get me to stop looking and start making ! Ok I have sat staring at the screen long enough. I am going to do this! 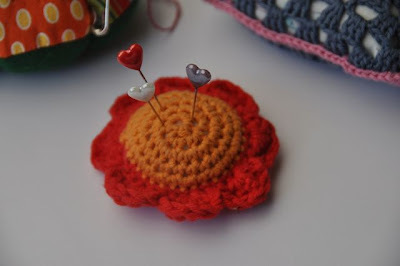 I have never made a pin cushion (or owned one, but I’d love to have one). I hope whoever my partner is they don’t mind a first attempt! Move over girls, make room for one more. I am going to send you an email right now with my details. Thanks for organizing such a fun swap. I would love to swap a pincushion if you are having people from other countries. Hi I'd love to be part of this project. Oh this is so cool! I have been wanting to do another swap for ages and I need a cute pincushion too. Count me in! I will email you my details now. yes, yes, yes! I would love to join. How fun! Thanks for hosting! I don't want to miss out - count me in too please Kate! Would love to take part. Love pinchushions! me too please. it sounds do-able and like some fun! Oh oh oh! Yes please! 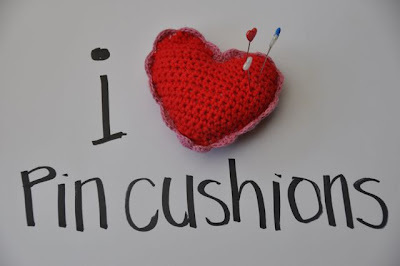 I'd love to make a pin cushion :D Count me in! Yes please - I'm all about the swaps right now. Just did a tea towel swap and it was so much fun. 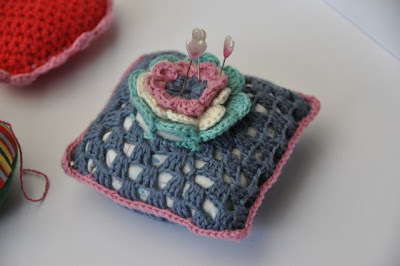 Never made a pin cushion before but your crocheted examples are so great! I'm inspired. Thanks Kate! Ooh. You can never have enough pin cushions. They are like happy little smiles upon the sewing table. Count me in. Ok, I will try and make it an even number, so commenter 92 I am. And, yes, that means I am putting my hand up to swap! Arrrgh! I can't believe I almost missed it! That's what you get for being vague, I guess. Please count me in, even though you already have huge numbers! I think you're very brave to coordinate this - my admin skills would let me down rather embarrassingly, I think! Yes I'd love to play. Sounds like lots of fun, please count me in. Hi, I like to join in the swap. My first one but sounds like fun! Hope it's not too late to say si! What a great simple idea! Please count me in! Some yarn & some exciting news.